A review paper by SPPI & CO2 Science finds, contrary to claims by climate alarmists, that warming causes fewer Atlantic hurricanes and has little to no impact upon the intensity of hurricanes. Climate alarmists continue to claim that rising temperatures lead to ever more intense Atlantic Basin hurricanes. But are they correct? We here review the results of a number of studies that are germane to this question. Several studies have actually found yearly hurricane numbers to decline as temperatures rise. When all is said and done, they report that their results "show no significant trend in potential intensity from 1980 to 1995 and no consistent trend from 1975 to 1995." What is more, they report that between 1975 and 1980, "while SSTs rose, PI decreased, illustrating the hazards of predicting changes in hurricane intensity from projected SST changes alone." The comparison of SSTs actually encountered by individual storms performed by Michaels et al. 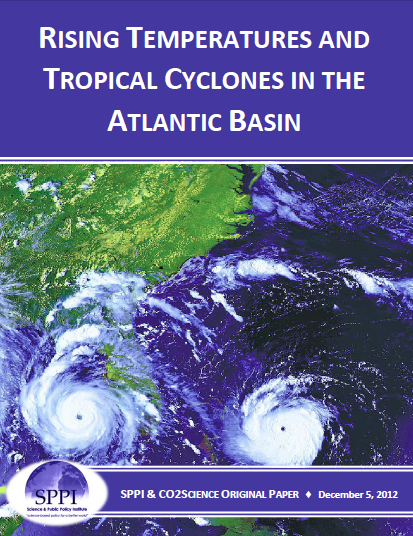 refutes the idea that anthropogenic activity has detectably influenced the severity of Atlantic basin hurricanes over the past quarter-century. While some researchers have hypothesized that increases in long-term sea surface temperature may lead to marked increases in TC storm intensity, our findings demonstrate that various indicators of TC intensification show no significant trend over the recent three decades. In addition to the growing body of empirical evidence that indicates global warming has little to no impact on the intensity of hurricanes, there is now considerable up-to-date model-based evidence for the same conclusion. Clearly, the temperature/hurricane connection is nowhere near as "one-dimensional" as Al Gore and others make it out to be. Warming alone does not imply that hurricanes are getting stronger. A future where relative SST controls Atlantic hurricane activity is a future similar to the recent past, with periods of higher and lower hurricane activity relative to present-day conditions due to natural climate variability, but with little long-term trend.